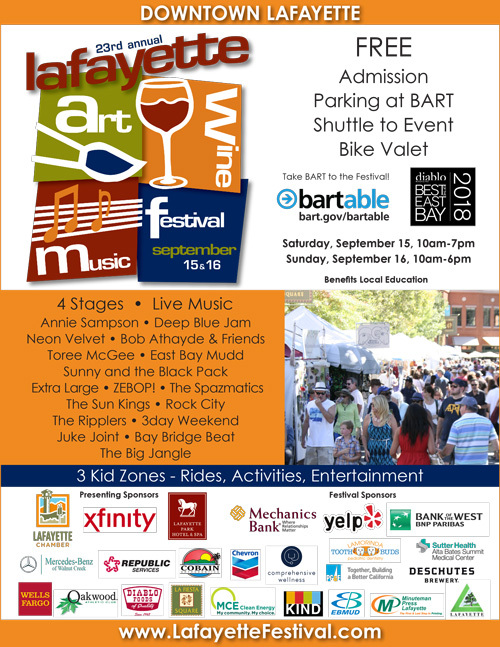 Non Profit & Art Events Happening in September! Do You Know a Child Who Likes to Sing? Contra Costa Children’s Chorus has merged with Cantabella Children’s Chorus, a non-profit community-based organization for boys and girls 5-18 and is accepting new members for the Fall 2018 semester. The international award winning Cantabella Children’s Chorus serves more than 200 children and youth at rehearsal sites in Livermore, Pleasanton, San Ramon, and now Lafayette. The Italian words “canta bella” translate to “sing beautifully”, which is describes the founding vision of Cantabella, committed to developing the love of artistic, beautiful singing in children and youth. Since 1992, Cantabella has focused on developing music literacy and healthy vocal techniques using the Kodaly approach. Cantabella also fosters choral artistry in its young singers through the performance of the finest choral literature from all genres and sung in many different languages. Active participation in performances develops poise, confidence, self-esteem, teamwork and the satisfaction of striving toward excellence. Children in the training choir levels (grades K-5) qualify for registration on a first come, first served basis. Children in the performing choirs (grades 5-12) will have a placement audition before registration. Weekly rehearsals are held on Monday at Our Saviors Lutheran Church at 1035 Carol Lane, Lafayette. For more information, please call 925-292-2663, email us at info@cantabella.org, or visit www.cantabella.org. Housing insecure youth and families are traditionally difficult to identify during our annual Homeless Point in Time Count. We are conducting a special count this year targeted just to these populations to better capture information about the need for housing and services for youth and families in our community. The count will focus on people in Contra Costa under the age of 25 and/or people raising minor children. The survey is being offered through Sunday, September 9. For additional information, contact Continuum of Care Planning and Policy Manager Health, Housing and Homeless Services Division Contra Costa Health Services at (925) 608-6716. The deadline is September 2. Help foster children get the school year off to a great start by donating new school supplies. You can drop them off at Moraga Rent-A-Space, 445 Moraga Rd. 1.4 mile run/walk starting at 8:45am. All ages are welcome! Entry fees are $25 for the 1.4 mile and $35 for the 3.1 mile (5K). Goodie bags, t-shirts, and prizes are included. Your entry will support the OPR Foundation's efforts to help fund critical renovations within the City of Orinda's Community Center Park. For more details, visit http://oprfoundation.org/calendar-events. Thursday, September 6, 5pm-7pm, J.McLaughlin, 3547 Mt. Diablo Blvd. Monday, 9/10, 6:30 - 8 p.m.
Friday, 9/14, 12:30 - 2 p.m.
Saturday, 9/22, 12:30 - 2 p.m.
Monday, 9/24, 6:30 - 8 p.m.
Friday, 9/28, 12:30 - 2 p.m.
Informational Sessions, except 9/7, are held at IEC office, 2151 Salvio St., Ste. 299, Concord. Come party with the cars in Orinda! Where were you in '62? Join us as this year's Dancing with the Cars celebrates American Graffitti. It’s the Festive 2018 Party the night before the Car Show, this year at Orinda Country Club. Set up like you’ve never seen it before! Purchase tickets for the event here. Miguel Elliott of Living Earth Structures will lead a two-day workshop to build a wood-fired oven made of adobe bricks and shaped like a domed bee hive at LCG. Cob is a combination of earth, sand and straw mixed to the consistency of mud and slopped on to a skeletal form to make simple structures such as garden benches, ovens and small huts. Workshop participants will learn each step of the building process and by the end of the weekend be able to create their own earthen structures at home. The garden will have a beautiful pizza oven! The cost of the workshop is $150 per person for the weekend, 10am to 5pm Saturday and Sunday. While you do not need to stay for the entire time, you’ll hate to miss any of this fun community project! Register here. Join us to create your own Garden Log (Fairy or otherwise) to decorate your outdoor garden or inside as a centerpiece to your table. We will provide sticks and logs of various sizes, collected here in Lafayette, along with pine cones, lichen and other natural findings for your use. Bring your own favorite items from nature that you would like to include in your Garden Log. Class appropriate for all ages. Parents need to accompany their young children under the age of 8 years. This will be a fun intergenerational activity! Each adult must register separately so we have an accurate count on attendees. Class members: if you find you are unable to come to the class, please text the instructor at (925)284-4426. Our classes are free. However, a $5 donation is appreciated to support our education programs. To register for classes or for more information, please visit www.lafayettecommunitygarden.org. Join the California Community Choice Association (CalCCA), MCE– California’s first Community Choice Aggregation (CCA) program, and CleanPowerSF for the Bay Area’s premier Global Climate Action Summit affiliate event. The event includes a panel discussion on how innovative local energy programs, private-sector engagement, and new technologies are helping to shape California’s clean energy future. An optional tour of local sites producing renewable energy will follow the panel discussion. Registration is required for both the panel discussion (free to the public) and tour (nominal fee)*. Registration will close on Thursday, September 6 or when maximum capacity is reached. Discounts/fee waivers for the tour are available for local non-profits, public agencies, and media. An official agenda will be provided prior to the event. Every year the California Legislature honors our local nonprofits with a Nonprofit of the Year ceremony. This year, Assemblywoman Baker has selected Special Education Enrichment Development Foundation (SEED) as the District 16 Nonprofit of the Year. A reception to honor SEED will be held on Wednesday, September 12, 2018 at 10:00am. It will be held at the Lafayette Library where there will be cake and refreshments. To attend, please RSVP to our District Office at District Office at (925) 328-1515 or online at asmrc.org/af/nonprofit. Pacific Chamber Orchestra, under the direction of Maestro Lawrence Kohl, presents “Mozart: The Grandeur” with Mozart’s “Jupiter” Symphony and his “Haffner” serenade with Igor Veligan as Violin soloist. Performances will be in the Lafayette-Orinda Presbyterian Church on Saturday, September 15th at 7:30 pm; and in the Bankhead Theater in Livermore on Sunday, September 16th at 3:00 pm. Enjoy how Mozart simultaneously pours forth beautiful music entwined with the complexities of human emotions. Tickets are available at PacificChamberOrchestra.org and additionally for Livermore at the Bankhead Box office, 2400 First Street in Livermore 925-373-6800. Sustainable Contra Costa will present the Leadership in Sustainability and Green Building Awards at the 10th Annual Awards Gala on Thursday, September 20th in Pleasant Hill. This fun and inspiring event supports and celebrates local individuals and organizations for their outstanding contributions and commitment to a healthy environment, economy, and society - so that Contra Costa remains a wonderful place for generations to come. Tickets at www.sustainablecoco.org. In partnership with the College Funding Coach, The California Student Aid Commission, and Special Guest Senator Steve Glazer. Come get advice on how to pay for college from financial planning experts and learn what the Legislature is doing to make higher education more affordable. Please RSVP at 925.328.1515 or ASMRC.ORG/AF/COLLEGEWORKSHOPLAFAYETTE. Thursday, September 20, 7pm, Lafayette Veterans Memorial Hall, 3780 Mt. Diablo Blvd. All residents are welcome! This year five candidates will be on the November ballot for just two City Council positions. Each candidate will have five minutes to introduce themselves and speak regarding their individual positions on various issues regarding our City. After each candidate has spoken, the audience will be able to ask questions of any candidate. Also this year there are four Lafayette School Board positions open and just four candidates. For this reason, the School District decided not to participate in the November election and each candidate will join the School Board as members. However, the LHC invited the School Board “candidates” to its Candidates Night and asked each to introduce themselves and speak for 2-3 minutes regarding their views on schools and education in Lafayette. The meeting will also include a brief “Annual Meeting” agenda by the LHC and we also hope to hear from our Mayor. So all please Come, Listen, Question & Decide! 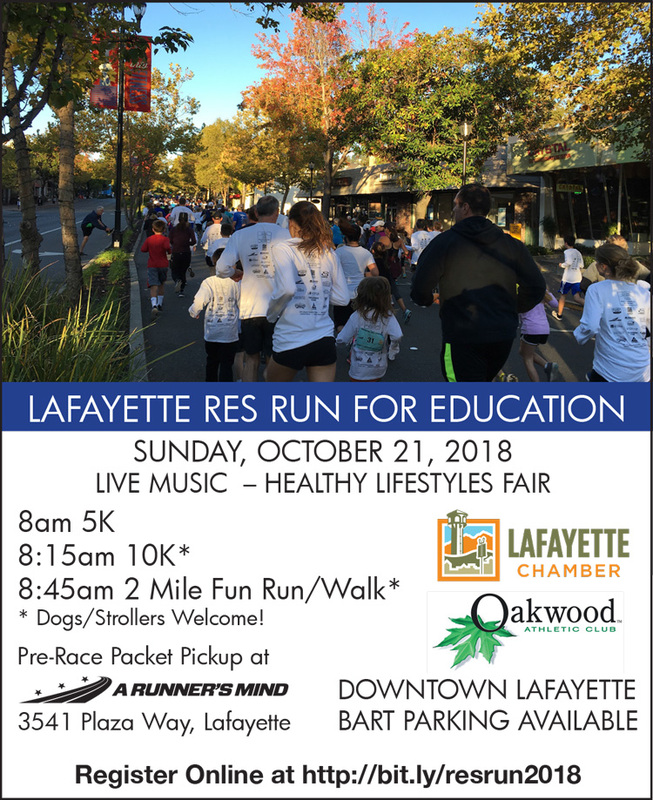 Join Las Trampas for our 9th annual Walk n’ Roll 1 mile walk, roll or run on Saturday, September 22th from 9:00am to 12:00pm at 3460 Lana Lane along the beautiful streets of Lafayette and ending at the Lafayette Plaza Park for the celebration. You can combine your daily exercise with a fun family event. $25.00 includes breakfast, live entertainment, Whole Foods bag, raffle prizes and a T-shirt. Register at www.lastrampas.org or call (925) 310-2363. 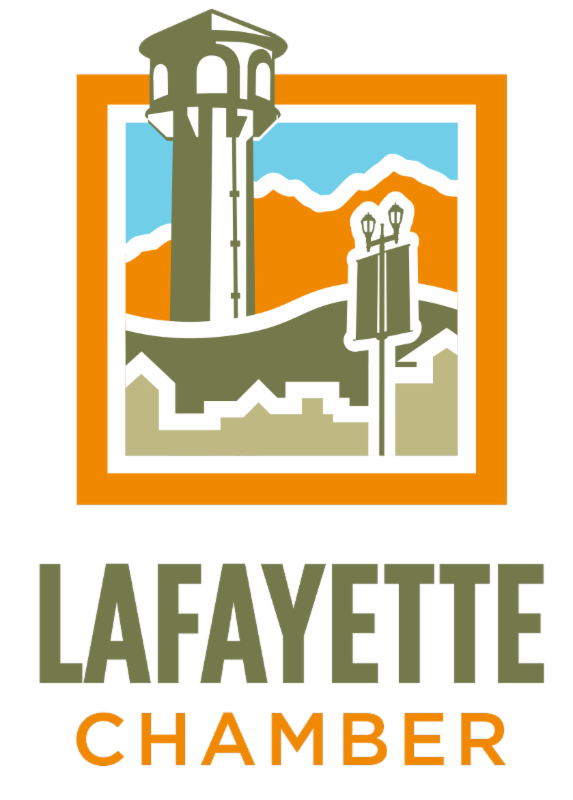 Join us for Coffee with the Mayor on Friday, September 21, 8am-9am, at the Lafayette City Offices, 3685 Mt. Diablo Blvd., Room 265. Join us for our September Mixer at Block Advisors, 3390 Mt. Diablo Blvd., Lafayette on Wednesday, September 26 from 5:30pm-7:00pm. Bring your business cards! Office will be closed Monday, September 3 for Labor Day and also closed Monday, September 17 for Festival cleanup.